Michael had heard about the Gingerbread House competition that takes place every year at the Grove Park Inn, but had never been. When he told me this–on the night of my 37th birthday party–I suggested we go together. The gingerbread competition began in 1992 and now has over 200 entries. All of them 100% edible. You may have seen the winners on Good Morning America. Or seen the whole thing profiled on the Food Network. And it was all happening at a historic hotel just a ten minute walk from my log cabin. So on December 7, Michael met me at my house, and we walked up Macon Ave to the Grove Park Inn. After touring two floors full of gingerbread, Michael suggested we get something to eat. After a light lunch on the outdoor patio overlooking the mountains, we meandered back to my house and parted ways outside my back door. I considered this our first date. Michael, I would later learn, did not. Not all entries are actually houses . . . 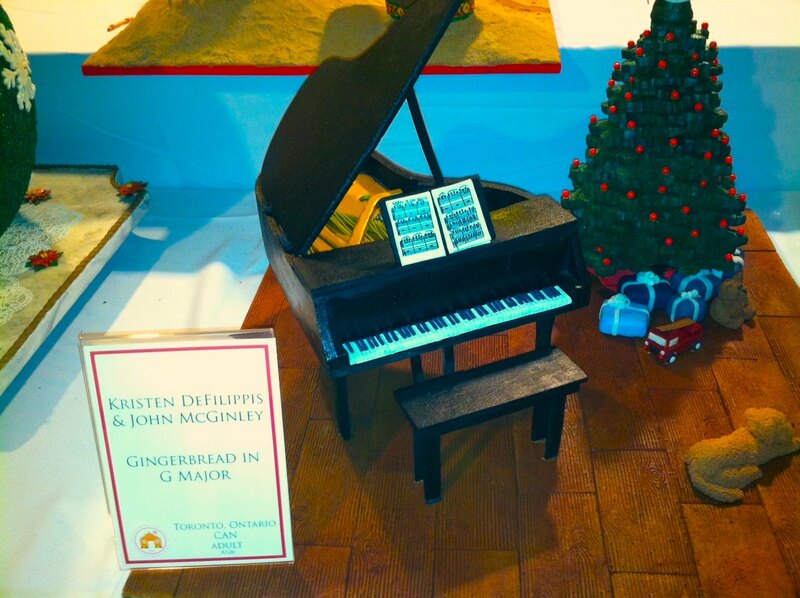 Gingerbread piano anyone? Four days later I came home from work to find a gift-wrapped box on my screened-in porch. I was stopping home only briefly before I headed off to a writing class, so I opened it quickly and was surprised to find a foil-wrapped pumpkin bread inside. I called my friend Mike (not to be confused with Michael), who assured me that any man who hand delivers a gift-wrapped anything to a woman’s house is definitely interested in her. Michael and I talked on the phone a few days before that dinner date. He told me he was good at the “middle stuff” when it came to dating, but not good at the beginning part. “Well, Michael Weston, I am very interested in you,” I said. “I would have preferred the second option,” he said. And so it is that we come to Michael’s definition of a first date: the first time he sees a girl after she has given him “the sign.” Thus, when I showed up at his house on December 20, according to Michael, it was our first date. Michael answered the door wearing an apron. I was dating a man who owned an apron! I entered his house through the dining room, where the table was set with candles and wine. He led me into the kitchen where he was cooking–in a wok. His gifts were definitely a hit. But it was New Year’s Eve when Michael gave me my biggest surprise. . .
For the final post in this series, click here. Sure, leave us dangling about New Years Eve. Hurry up and post it. Can’t wait for the next post on you and Michael. He sounds like a romantic, to me.